Yudhishtira replied, “Be happy that your desire has been fulfilled. We are Kshatriyas. We are the sons of Pandu. I am Yudhishtira. The one who won your daughter is Arjuna. This is Bhima. The twins are Nakula and Sahadeva. Our mother Kunti is in the inner apartments with Draupadi. Your daughter, like a lotus, has just been transferred from one lake to another." Hearing these words, Drupada became so joyous that he became choked with emotion and couldn’t speak for a while. He then asked Yudhishtira how the Pandavas escaped from the fire that took place in their abode at Varanavata. 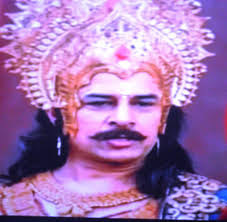 Drupada became angry and censored Dritarashtra for his role in the affair. He assured Yudhishtira of his support to the Pandavas, vowing to restore the throne to Yudhishtira. When the three of them were discussing this issue, Vyasa came to that place in the course of his wanderings. The great sage was received warmly and everyone paid obeisance to him. It was Yudhishthira who spoke next. He said, “My tongue never utters an untruth, and my heart never inclines towards what is sinful. Therefore, when my heart accepts something, it can’t be sinful. I have heard that it has been mentioned in the puranas that a woman by name Jatila, the foremost of all virtuous women belonging to the race of Gotama, had married seven Rishis. Vyasa then took Drupada aside to tell him how this practice was virtuous. Vyasa told Drupada that the Pandavas were five Indras born into the world due to a curse of Lord Siva and that Draupadi was also a celestial woman. That was why she was born in a sacrificial fire, he said. Vyasa revealed that it was Lord Siva’s dictum that the celestial woman would be the common wife of the five Indras, when they were born in the world as human beings. Vyasa also granted a divine vision to Drupada that enabled him to see the Pandavas and Draupadi in their celestial forms. After seeing the five Pandavas and Draupadi in their celestial forms, Drupada was convinced about the virtue of Draupadi becoming the common wife of the Pandavas. Drishtadyuman narrated to his fathe,r the scenes he witnessed when he followed Draupadi and the “Brahmin” who won her hand in the Swayamvara. He confirmed to the king that it was indeed Arjuna who was disguised as the Brahmin that shot the target in the Swayamvara and became qualified to win the hands of the princess. Drupada was elated on hearing this. However, he sent his priest to confirm that the five Brahmins were the Pandavas. Yudhishtira asked Bhima to wash the feet of the priest saying that being Drupada’s priest, he deserved great respect. Accordingly, Bhima washed the priest’s feet. The priest was pleased. The Pandavas then sent away the priest and departed to the palace. While Kunti and Draupada ascended one chariot, the five Pandavas ascended another. 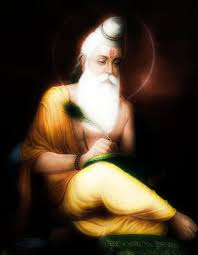 Briefed by the priest of the conversation he had with Yudhishtira, King Drupada, with a view to ascertaining the order to which the heroes belonged, kept a large number of articles required by each of the four orders for their wedding. He also kept fruits, garlands, carpets, seeds, agricultural implements, beautiful chariots and horses, bows, arrows and other missiles of high quality and value, darts, rockets, battle-axes and other weapons, beds, clothes and several other articles. After the Pandavas arrived at the palace, Kunti, along with Draupadi retired to the inner apartments of the palace. The ladies present there worshipped Kunti with joy. The Pandavas, each having the gait of a lion, wearing deer skins as his upper garment, with eyes resembling those of bulls, with broad shoulders and long arms looking like snakes were looking joyous and cheerful. The king’s son, ministers, friends and servants were also happy. After the guests were seated on highly comfortable seats, the male and female servants brought them excellent food and drinks on gold and silver plates. After ingesting the excellent food served, the Pandavas began to look at the articles displayed. Ignoring all other articles, they focused on the weapons. Watching this, Drupada, his son, ministers and others felt reassured that the heroes were of royal blood and felt relieved and happy. Kunti was anxiously awaiting the return of the Pandavas. She was speculating on various eventualities. She was worried whether her sons were recognized and killed by the sons of Dhritarashtra, whether they were killed by some demons or whether some other thing happened. All the five Pandavas looked at Draupadi and she also looked at them. Draupadi’s exquisite beauty stirred a desire in their hearts and crushed their senses. Krishna and Balarama then left the place lest other kings should follow them and recognize the Pandavas. Dhrishtadyumna, the Panchala prince followed the Pandavas to their abode. He sent away his attendants who accompanied him and concealed himself in the Pandava’s house. After they had taken their food, they all went to sleep. While the five Pandavas and Kunti lay down with their heads towards the south, Draupadi lay down along their feet on a bed of Kusa grass laid by Sahadeva. The Pandavas were conversing among themselves for a long time about weapons and wars. Dhrishtadyumna was listening to the conversation. In the morning, he returned to his kingdom. Drupada who, for long, had nurtured the hope of getting his daughter married to Arjuna, was disappointed that Draupada was won by a Brahmin. As soon as Dhristadyumna came back, Drupada anxiously enquired him of Draupadi. King Drupada expressed his intention to bestow his daughter on the Brahmin, who had hit the mark and won the contest. This enraged the kings who had come to the Swayamvara, hoping to win the hand of Draupati. They considered it an insult that the kings were bypassed and a Brahmin was chosen as the groom for Princess Draupadi. They talked among themselves in the following lines. When some of the kings raised their weapons intending to attack and kill Drupada and Dhrishtadyumna, Bhima and Arjuna advanced towards them. This made the kings point their weapons towards the duo. Bhima uprooted a tree, divested it of its leaves by violently shaking the tree and stood before the kings like Yama standing with his mace. Arjuna also stood beside his brother, ready to use his bow. Krishna again pointed the brothers to Balarama and said "They are Bhima and Arjuna, as surely as I am Krishna. No one except Bhima can perform a feat like this." The Brahmins present there came forward in support of Arjuna and offered to fight the kings. Arjuna smiled at them and said, “Stand aside and watch the fight as spectators. I will shower my arrows on these kings and subdue them the way one can bind the snakes through mantras." The kings decided to confront Arjuna and Bhima intending to kill them though they were (believed to be) Brahmins, reasoning that killing a person who had entered a fight was not wrong. Karna was in the lead. Karna sought out Arjuna, while King Salya of Madra (the maternal uncle of Nakula and Sahadeva) sought out Bhima. Initially Karna fell down unconscious by the impact of Arjuna’s arrows. But he regained consciousness and resumed his fight. The two fought with each other fiercely. Duryodhana and others turned to the Brahmins and had a skirmish with them. After some time, Karna stopped fighting realizing that he could not overcome the energy of the Brahmin. The fight between Bhima and Salya went on as a fight between two equally strong warriors. After a while, Bhima lifted up Salya and threw him down. However, he did it without causing him much injury or pain. 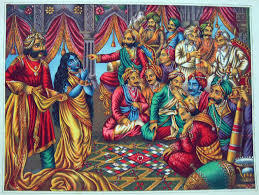 Krishna addressed the kings and said “Draupadi has been justly acquired by these Brahmins” and advised them to abandon the fight. The kings accepted the fact that Draupadi was won by a Brahmin and returned to their kingdoms. The Pandavas were surrounded and cheered by the Brahmins who were proud of the feat of Bhima and Arjuna, whom they considered to be Brahmins like themselves. Eventually, the Pandavas left the arena taking Draupadi along with them. The Brahmins and Krishna followed them. Meanwhile, Kunti began to worry about her sons having not returned home even after a long time. She began to harbor fears about various kinds of mishaps that might have befallen them. She even doubted whether Vyasa had misguided them by advising them to participate in Draupadi’s Swayamvara. It was only in the late afternoon that Arjuna, entered the house in the company of many Brahmins. Arjuna asked the Gandharva to suggest whom the Pandavas should appoint as their priest. Arjuna took leave of the Gandharva after presenting him his weapon of fire. He told the Gandharva that they would collect the horses presented by him when the occasion for using them came. The Pandavas went to Utkochaka, met Dhaumya and after presenting him with fruits and roots, requested him to be their priest. When Daumya consented to their request, the Pandavas felt as if they had already regained their lost kingdom and had won Draupati in the Swayamvara! After receiving the blessings of Daumya, the Pandavas, along with Daumya, set out to Panchala to participate in the Swayamvara of Draupadi. On the way, they met some Brahmacharis (Brahmin bachelors) who were also proceeding to Draupati’s Swayamvara. When these Brahmins learnt that the Pandavas were also proceeding to attend this event, they told them about the grandeur of the event and about the large amount of wealth that would be gifted to the Brahmins. "You people can also receive valuable presents and money," they said. Yudhishtira told them that they would all go together for the event. On the way, they met Sage Vyasa and received his blessings. On reaching the capital city, they stayed in the house of a potter. Many Kings, Duryodhana among them, came for the event with a keen desire to win the hand of Draupadi in marriage. Many sages and Brahmins were also present to witness the spectacular event. All of them went around the mansion and looked at the grandeur of the mansion with amazement. The Pandavas also reached the venue. After the sacrificial fire was lit to propitiate Agni, the God of Fire and the invocation was done by the priests by chanting mantras (divine hymns), Dhrishtadyumna came to the arena holding his sister Draupadi’s hand and spelt out the task already outlined by his father. Many celestials like the Adityas, the Vasus, the Rudras, the Aswin twins, the Swadhas, the Marutas, the Daityas, the Suparnas, the Nagas, the Charanas, the Gandharvas, Kubera, Yama, Viswavasu and Narada had also come to witness the event. Krishna was also present along with his elder brother Balarama. Krishna pointed the Pandavas, who were in disguise, to Balarama. Balarama was happy to learn of the Pandava’s presence. The princes attempted to string the bow but none of them could succeed. Many of them were thrown to the ground by the weight of the bow. Duryodhana and his brothers also failed in their attempts. Karna then came forward to demonstrate his prowess. 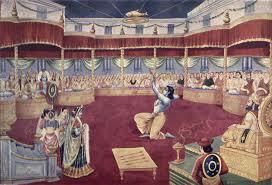 But even as he lifted the bow, Draupadi said firmly that she won’t accept the son of a charioteer as her husband. Karna withdrew, throwing the bow down in disgust. After this, other kings including Sisubala, Jarasandha and Salya (the maternal uncle of Nakula and Sahadeva) attempted to string the bow but failed in their attempts. After all the kings had tried and failed, Arjuna, who was seated among the Brahmins, rose from his seat and proceeded towards the bow. There was a clamour among the Brahmin spectators, with some cheering him and others showing their disapproval. Arjuna strung the bow in the time it would take for twinkling of the eye. He hit the mark with the arrow and brought it down. The kings who had tried and failed gave out exclamations of grief and despair. Flowers were rained from above. The musicians began to play the instruments and the bards began to chant encomiums in praise of the person who had accomplished the feat. Drupada recognized Arjuna and felt joyous. The Brahmins saluted him in reverence. Krishna got up from his seat, went to Arjuna and garlanded him. The Gandharva then pointed out to Arjuna that he and his brothers lacked three things. First, though they had completed their studies, they were yet to get married. Second, they were not following any Ashram (way of life) While their life of Brahmacharyam (bachelorhood) was over, they had not yet entered Grahastashram (the married life). Third, they were without the guide of a priest (Guru). The Gandharva said that he lost to Arjuna in the fight because Arjuna was not married while the Gandharva himself was under the grip of anger at having been humiliated in front of his wife. The Gandharva would defeat a married man but if the married man had a priest to guide him, the Gandharva won’t be able to defeat him. That was the power of having a priest as a guide, he said. He then narrated the story of Samvarana, one of Arjuna’s ancestors. Samvarana, the son of Riksha, once met Tapati, the daughter of Surya, the Sun God. in the forests and instantly fell in love with her. When Samvarana expressed his love to Tapati, she said that she had also fallen in love with him but that he should seek her father’s consent for having her as his wife. After Tapati went away, Samvarana became unconscious, unable to bear the separation. His minister came to him and helped him gain consciousness by sprinkling water on him. When the minister advised Samvarana to return to his kingdom, the king refused to come. He sat there in penance prating to Surya. He also prayed to Vasishta, the Guru of his kingdom, to help him. Sage Vasishta appeared before him on the 12th day and offered to help him. Vasishta went to Surya and asked him to give his daughter Tapati in marriage to Samvarana, after apprising Surya of Samvarana's virtues. Accordingly, Vasishta performed the marriage of Tapati with Samvarana. After marrying Tapati, Samvarana remained in the forest for 12 years. He did not visit his capital even once. There were no rains in the kingdom for these 12 years. Affected by the severe drought, people began to leave the country. Seeing the plight of the people affected by the drought, Vasishta came to Samvarana and asked him to return to his capital. After Samvarana returned to his capital, it began to rain and the drought came to an end. To express his gratitude to Indra for blessing his kingdom with rain and ending the drought, Samparana, in the company of his wife Tapati, performed a sacrifice for 12 years. The Gandharva advised Arjuna to have a learned Brahmin as his priest to accomplish great things. After Bakasura was slain, the Pandavas were living a quiet life. One day, a learned Brahmin visited them. The Pandavas entertained him as their guest. At the request of the Pandavas, the Brahmin spoke to them about the various countries he had visited and about moral values. He then spoke of the Swayamvara* of Draupati, the daughter of the Panchala king Drupada (also kown as Yagnasena). He also narrated the story of Drupada’s obtaining his son Drishtadyumna and daughter Draupadi through a sacrifice. After the Brahmin had let, Kunti suggested that they leave for Panchala since they had stayed at Ekachakra for a long time. Her sons agreed. They left that place after taking leave of the Brahmin in whose hose they were residing. As promised by him earlier, Vyasa came to see them. Kunti and her sons received the sage and paid obeisance to him. After enquiring about their welfare and their activities and advising of their moral duty to pursue a virtuous path, he narrated a story. A sage had a daughter. Though she was beautiful and virtuous, she could not get a husband. She practiced ascetic penances for seeking a good husband for her. Pleased by her penances, Lord Siva appeared before her and asked her to seek any boon that she wished. She said, “Oh lord! Give me a husband endowed with all accomplishments.” In her anxiety, she repeated her request several times. Vyasa then took leave of them. Kunti and Pandavas left for Panchala. When they were walking on the banks of the Ganga, a Gandharva who was sporting in the river with his wives intercepted them. 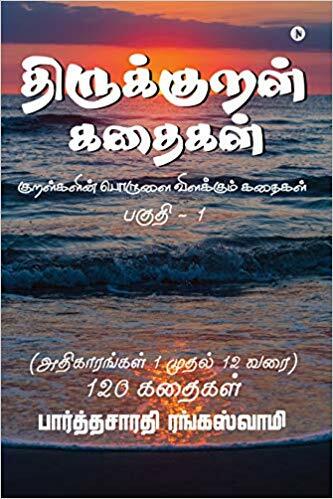 He told them, “As you know, except for the first forty seconds, the twilight preceding the nightfall is earmarked for the wandering of the Yakshas, the Gandharvas and the Rakshasas, near reservoirs of water. If any other person wanders near any pool of water during this time, we will kill them. Therefore, even kings do not come near any reservoir of water during this appointed time. Arjuna replied, “Whether it is day, night or twilight, who can bar anyone from visiting the ocean, the Himalayas and this sacred river? People who are too weak to fight you may fear you and avoid coming here. But we are mighty people capable of taking on you. So, we are not concerned about disturbing you. "This river emanating from the Himalayas gets distributed into seven streams before reaching the ocean, the streams being Ganga, Yamuna, Saraswati, Vitashtha, Sarayu, Gomati and Gandaki. All the seven streams have the power to clean people of their sins. Enraged by Arjuna’s words, Angarparna began to shoot arrows from his bow on Arjuna. Arjuna hurled the weapon at Angarparna. The weapon burnt the Gandharva’s chariot making him fall head downward. Arjuna seized his head and dragged him towards Yudhishtira. Kumbhinasi, the Gandharva’s wife appealed to Yudhishtira to save her husband’s life. Yudhishtira asked Arjuna to spare the life of the Gandharva and Arjuna obeyed his brother’s command. The Gandharva told Arjuna, “From now, I abandon my name Angarparna, since I have been vanquished by you. In return for your sparing my life, I want to impart to you the science of producing illusions, which only the Gandharvas have mastered. Arjuna agreed to this suggestion. He told the Gandharva that they would remain friends forever. *Swayamvara – an event in which a prospective bride 9a princess)will choose her groom from among the men offering to marry her. This practice had prevailed mostly among kings. Is Your Fat Loss Diet Working? Everyone has an urge to share his or her thoughts, experiences, ideas and fantasies with others. If you like what I write, it serves the purpose of my writing. If you do not like what I write, I will be content with the satisfaction of giving expression to my thoughts.